My sister told me it was for wearing my baby as she handed me the baby wrap. I looked at her like she had stepped off the planet Zonkers. It was an excessively long piece of material designed to be twisted, wrapped, tied, and superglued to my body. I’ve seen people wearing these contraptions with a baby strapped to them before, and quite honestly, I didn’t want to be one of them. And then little EK came along. I quickly discovered the need to grow six more arms. If I could be any super hero of my choosing? That’s easy. OCTOPUS MOM! Washing dishes is not the easiest task with a newborn in your arms. It’s practically impossible. As are many other chores. It takes two hands to wash a pot, fold a towel, make a bed. Now, don’t get me wrong. EK is fine and content being put down. She’s a great baby. It’s not really her, you see. It’s me. I want to hold her. I can’t hardly stand leaving her in one room to go work in another. I realize I will only have myself to blame later on down the road. The day Jolea presented me with this monstrosity of material, we tried it out. My niece Ash was reading the directions in Greek I think, my sister was trying to follow them, I was standing there arms spread, sweating like a dog, dangling a fake baby by the arm, while my sister steered, groped, and maneuvered this wrap around my body. When I tried it with an actual baby, after watching several videos entitled, “How to put on a baby wrap for idiots”, the actual baby hated it. I only made her stay in there for a couple of minutes, thinking it might grow on her, but, uh, no. She hollered. Today was a beautiful day weather wise. One of those Spring days I wish everyday was like. I wanted to go for a walk to enjoy this delightful day and also not one person has offered to take this post pregnancy weight off my hands. Or my belly. I’ve tried the stroller, but the dirt roads are just a bit too bumpy for my little baby just yet. So, my other option was the wrap. I can now actually put the thing on without the idiot’s instructions. I’ve never worn a straight jacket before, at least not that I’ll admit to, but I’m thinking this isn’t far from it. Once the baby was good and secure, we headed out. What we looked like before. I’m not sure if EK is just a bit small for the forward facing position or if I just have a little bit too much swing in my hips, but it was a bumpy ride for the little darling. I felt the need to hold her head to keep from whiplashing her. She didn’t cry during this attempt, and surprisingly she fell asleep. We set off with the sun beating down, the birds singing, and the gravel crunching. It’s ironic to me that I carried EK on the front of my body for 9 months with relatively few problems, but walking a mile just about did me in. Nevermind the fact that she was about 4 pounds lighter and swimming in a bowl of water upside down, controlling her own head and neck way back then. Nevertheless, I got quite the workout. I used muscles that hadn’t been used in quite some time and my brow got a good mopping too. The farther we walked, the hotter we both got. I’m sure wintertime is a great season to wear this outfit, but someone really needs to make one out of mesh for this hot momma, and I mean that literally. When we got home and unstrapped ourselves from it, I reminded myself of a horse after a long hard day with a saddle blanket on, if you know what I mean. what we look like after. EK's a little whopper jawed. I then celebrated our accomplishment with 3 cookies and a glass of milk. Emma just had the milk, but she was sure eyeballing my cookies. 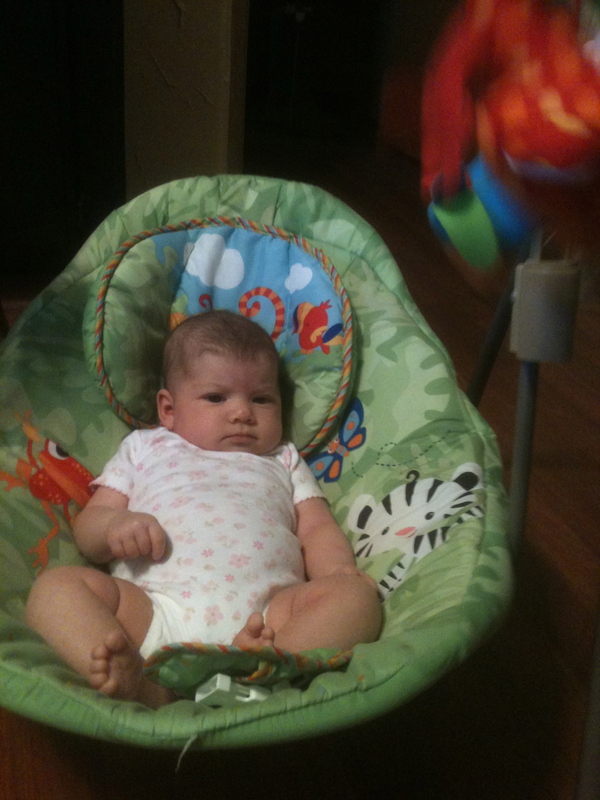 Life is good in her swing. 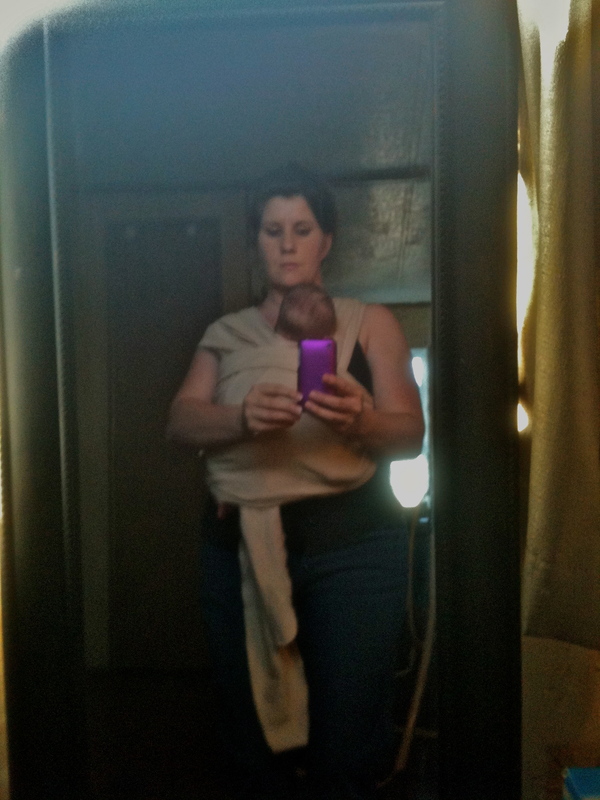 The moby wrap definitely would get hot, but after a few tries and practices, I still prefer it over the baby bjorn (the bjorn would just let the legs sort of dangle, which is terrible for their hips). Love it! I need some EK time! Oh yeah … Emma Kate looked a little “discombobulated” in that return home photo!!! (giggle, giggle) My grand daughter tried one of these also, but too hot and humid in the merry months of May,(well. o.k. June. July and August too, for that matter!) on her farm in Iowa!!! Gotta be a better “mousetrap” out there somewhere! She looks right comfy in her lovely swing, (Those legs are just wwwaaayyy too sweet.) tickle, tickle. Thanks for the update. Until next time .. Donna H.
Angel ~ I love this story! You have me giggling out loud. I love it and I am soooo happy for you. No other experience like it in the world!! 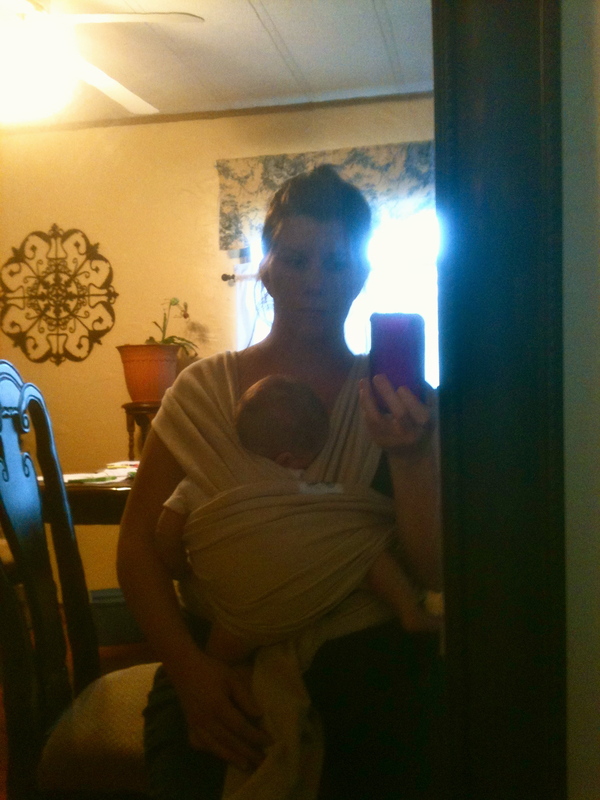 I used a sling for my boys, and I loved it. I wore that thing daily. It wasn’t a wrap, though. I am glad you figured out how to use it. You and the baby looked good in it.